Last week I wrote about Gustave and Gussie’s one year old son David, who died on December 25, 1892. Today I received David’s death certificate, and it confirmed that this was their son. It also revealed his cause of death: meningitis. Having known a young child who had meningitis when he was just a few months old, reading this caused me to stop and once again be thankful that we live in an era of modern medicine where most children survive what were once deadly illnesses, although meningitis remains a danger to children and adults. I also am not sure what to make of the notation here that a contributing cause to his death was teething. Really? Teething? I will have to ask my brother whether there is or was anything that linked teething to meningitis and/or death. The certificate also indicates that the doctor had cared for David from December 6 until December 18, but had not seen the baby in his last week. He wrote, “Child lingered hopelessly for the last week therefore no MD was called in during last days.” How awful that must have been—to watch a one year old child just literally pass away and not be able to do anything about it. 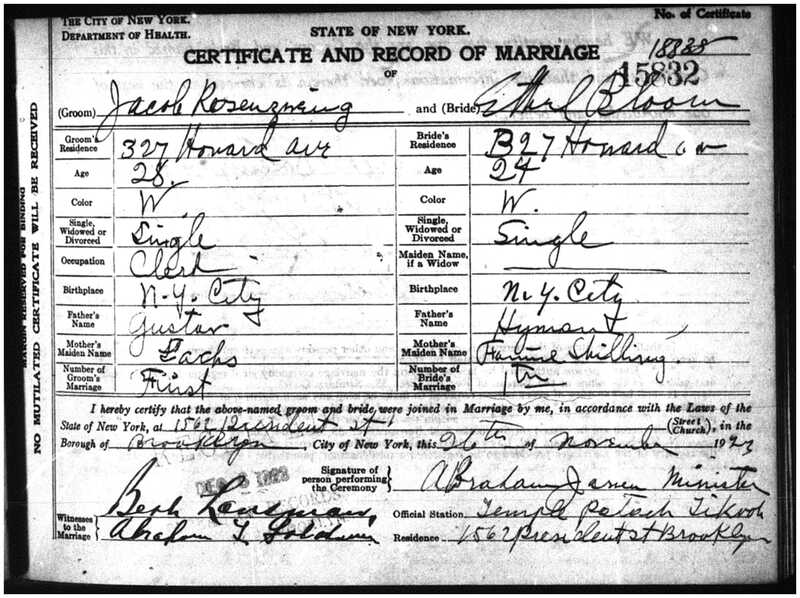 I also received the marriage certificate for Jacob/Jack/John Rosenzweig and Ethel Bloom, confirming that this was the correct Jacob, as indicated by the names of his parents provided on the certificate. Interestingly, Jack and Ethel each gave the same residence: 327 Howard Avenue. 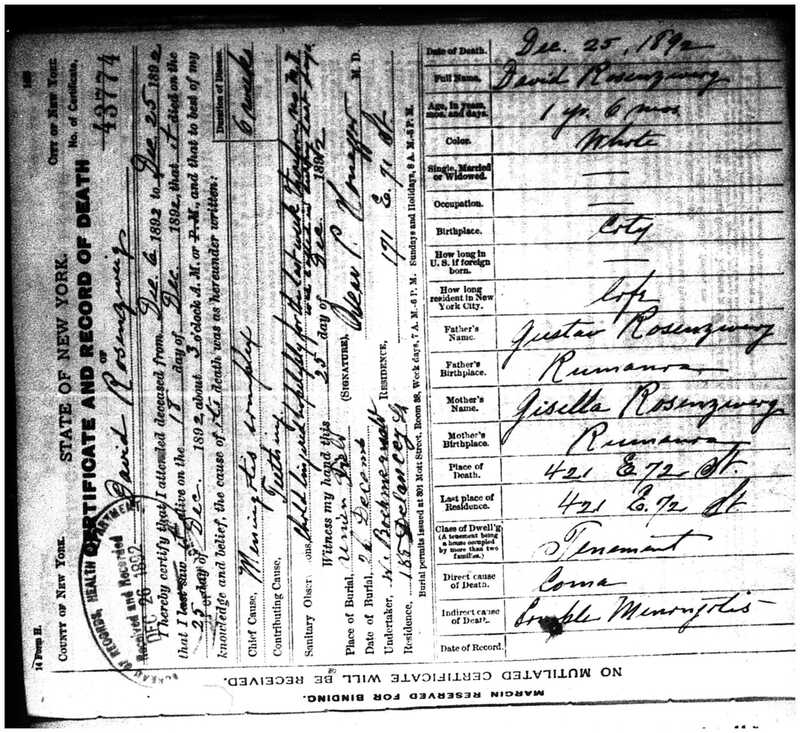 I doubt they were living together before they were married (it was 1923), so either they were providing their expected address for after the wedding or they had been living in the same building on Howard Avenue. Jack was 28 years old, and although he had been living with his family on Bergen Street in 1920, perhaps he had moved out on his own to Howard Avenue and met Ethel there. This entry was posted in Miscellaneous information and updates, Rosenzweigs and tagged Brooklyn, David Rosenzweig, Death certificate, Family, Gustave Rosenzweig, Howard Avenue, Meningitis, Rosenzweig by Amy. Bookmark the permalink.